Saudi King Salman is meeting Friday with President Obama, Vice President Joe Biden, Secretary of State John Kerry, and National Security Adviser Susan Rice. King Salman had declined to attend Obama’s Gulf Summit in May, apparently over anger at the negotiations with Iran over its civilian nuclear energy program, and issue that will undoubtedly preoccupy the Friday summit. US-Saudi relations are in bad shape, and the meeting is clearly intended as an attempt to reboot them. 1. Whatever they say in public, Saudi officials are angry about the Vienna agreement between the UN Security Council and Iran allowing the latter to enrich uranium for reactor fuel but forestalling through inspections and other measures any Iranian breakout toward a nuclear bomb. Wikileaks revealed a state department cable that alleged that current Saudi Foreign Minister, Adel Jubeir, urged the Bush administration to bomb Iranian nuclear facilities. Obama and his team will attempt to convince the Saudis that the Iran deal forestalls an Iranian nuke, rather than permitting it. A subtext of the successful negotiations with Iran is that international sanctions will gradually be removed from that country. Iran will be able to pump 1.5 million barrels a day more than it does now, and will be able more freely to engage in trade. These steps will further lower the price of petroleum, hurting the Saudi economy, and will make Iran economically stronger, a development unwelcome in Riyadh. It is hard to see how Obama will be able to mollify King Salman over these developments, which inevitably worsen Saudi Arabia’s geopolitical situation in the short term, at least. Perhaps more US arms and security guarantees will take the sting out of it. 2. The US sees Daesh (ISIS, ISIL) as far more threatening than does Saudi Arabia. For Obama, defeating Daesh is perhaps the most important campaign in which his administration is engaged in the Middle East at the moment. Saudi Arabia did not create Daesh and does not like the organization. But it knows that if Daesh is rolled back in Iraq and Syria, Shiite Iranian allies will likely be the biggest beneficiaries, and so it has put Daesh on the back burner. Obama will try to convince King Salman to step up. The US is willing to ally with Iran on a de facto pragmatic basis to defeat the faux caliphate. Saudi Arabia won’t be able to bring itself to go so far. 3. Saudi Arabia is backing rebel Ahrar al-Sham (Free Men of Syria) and Jaysh al-Islam in Syria, both of them hard line Salafi movements that don’t believe in democracy but do want a Taliban-like Muslim religious state with a literal approach to Islamic law. The Free Men of Syria are in turn allied with the al-Qaeda affiliate, the Support Front (Jabhat al-Nusra). The US wants the Free Men of Syria to repudiate al-Qaeda before it can accept it as “moderate” rebels. But for local tactical reasons, The Free Men need al-Qaeda in their struggle against the Baath regime of Bashar al-Assad. The US has therefore allied instead with left wing Kurds in Syria and has attempted to create a moderate rebel group, but has largely failed. The US and Saudi Arabia agree that al-Assad should go, but the US won’t cooperate with an al-Qaeda ally, whereas the Saudis see an al-Assad defeat as more important that avoiding any cooperation with an al-Qaeda affiliate. It is not clear that this gap between Obama and King Salman can be closed. 4. The Obama administration has generally been supportive of the Saudi-lead war in Yemen, and has given logistical support. I hear an NSC staffer just this weak talk about Iran’s “malign intent” in Yemen. While Riyadh and Washington see the Zaidi Shiites Houthi movement as Iran-backed, in fact it is local and indigenous, and the Iranians have given it very little material support (maybe $3 million). There have been some indications of squeamishness on Washington’s part with the intensive and apparently indiscriminate bombing of Yemen by Saudi Arabia and its allies. The war is going relatively well for Saudi Arabia, given that the Houthis unwisely over-extended themselves into Sunni territory. But the Houthis in Yemen just are not at the top of Washington’s list of Dire Threats, whereas for Riyadh they are enemy number 1. While the Saudis have perhaps made some bombing runs against Daesh, they have waged a very intensive war against the Houthis, whom they code as Iran-supported. Saudi Arabia is becoming a regional military power and is largely armed by the United States. The Saudis want new warships for their small navy so that they can patrol the Gulf, and that item will bulk large in the discussions. Basically, the best Obama can hope for is that King Salman, unlike Israeli PM Binyamin Netanyahu, won’t try to torpedo the Iran deal. He is unlikely to get buy-in from the king on shoring up the Shiite government in Baghdad. Washington is squeamish about Saudi Arabia’s indiscriminate bombing campaign in Yemen. The US and Saudi Arabia don’t back the same people in Syria, though they do both affirm the need for overthrowing al-Assad. For the US, al-Assad and his regime are a problem that can be addressed later, after Daesh is defeated. In the meantime, the US needs the Shiite militias to defeat Daesh, which means not angering Iran by getting rid of their ally in Damascus. Obama and Salman will both come away with something. But on many pressing issues, they won’t get even close to agreement. 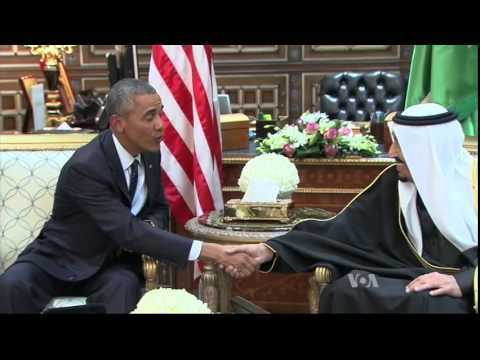 Saudi acquiescence in the Iran deal, even if grudging, is Obama’s biggest goal. American acquiescence in a new, more muscular Saudi foreign policy in the Middle East, is probably what Riyadh most wants from Obama.